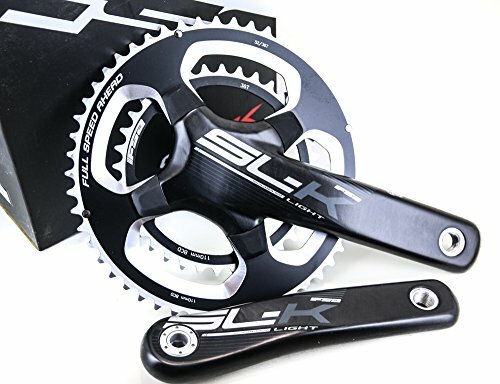 FSA SL-K LIGHT BB30 / PF30 CRANKSET NEW / MSRP $610.99 / SHIPS IN 24HRS SPECIFICATIONS: Manufacturer: FSA Model: SL-K Light ABS, CK-OSC8683NCC Length: See title / Specs Mass: 591 grams Speed: 10/11s Shimano/SRAM Spindle type: BB30 / PF30 Chainrings: 52/36T Bolt Circle Diameter (BCD): 110mm, 4-bolt Includes BB30 bottom bracket. Condition: New in box Note: Images and weight taken from size 170mm version Compatibility: BB30 Shells - 68mm wide with an inner diameter of 42mm (Included bottom bracket is compatible for this application) PF30 Shells - 68mm wide with an inner diameter of 46mm (NO bottom bracket is included for this application - buyer must supply their own) It is important to note that it is not compatible with any type of shell other than these two. No adapter is possible for other bottom bracket shell types.